Pure Guittard chocolate, amaretto, almonds, coffee, Grand Marnier, lemons, peppermint, peanut butter, raspberries, chili pepper, and champagne, hazelnut, and white chocolate ganaches. Le Grand Truffles: An Old Luxury Born in the Golden State! Over thirty years ago Jack Shaw, proprietor of Le Grand Confectionary, discovered that what he loved most about the baking business was the CHOCOLATE. Five years later, in 1982, he opened a hand-dipped chocolate store in downtown Sacramento specializing in truffles. At this time most chocolates in California and the U.S. were fondant-based products, meaning they had a center made primarily of sugar. Long popular in Europe, truffles are an upscale variation of fondant center chocolates. 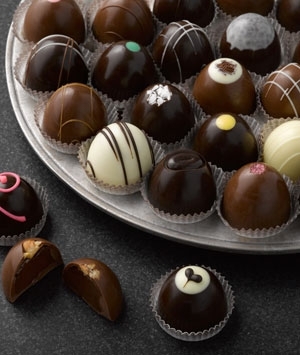 Instead of sugar, truffles are filled with ganache—cream or chocolate or butter or wonderful combinations of the three. Over the years, word and demand spread to such a degree that Jack moved into the wholesale business. Today his legendary truffles are available in fine retail stores throughout the country. Created using the finest quality ingredients and the same small-batch manufacturing methods Shaw used in his Sacramento store, truffles don’t get any better than this! One key to Le Grand Confectionary’s success is that they use only pure chocolate from Guittard, a California company and the oldest family-owned and -operated chocolate company in the U.S. It’s also one of the few remaining suppliers not owned by a large conglomerate. 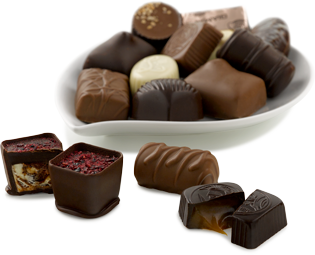 Guittard has for many years been one of the foremost sources of fine chocolate for renowned professionals in the confectionery, pastry, and ice cream industries. After purchasing the chocolate, Le Grand Confectionary melts and tempers it: manipulating the temperatures to ultimately set the cacao butter at its most stable point. As you may know, chocolate is rich in cocoa butter. The challenge for chocolate makers is that cocoa butter consists of four different types of crystals, each with a different melting point. It’s classified as a polymorphic substance, “poly” meaning many and “morphic” meaning shape. When the temperature is cooled to create solid chocolate, only one of the four crystals is stable; known as the beta crystal (or “B” form). If this isn’t done properly during the manufacturing process, the cocoa butter rises to the surface of the chocolate, creating a condition called “chocolate bloom,” and the product is marred by a grainy texture, gray and white streaks, and dots. (If you have ever left a chocolate bar on the seat of your car, you have likely seen chocolate bloom.) Successful tempering results in a smooth, shiny chocolate product with good mouthfeel. (Our wine and beer aficionado friends don’t have a monopoly on the phrase “mouthfeel.” It’s important to chocolate lovers, too.) All Le Grand Confectionary truffles start with a mold for the shells, into which fillings are either placed or piped in by hand. The truffles are then hand decorated to become a feast for the eyes as well as the mouth. Here's a quick rundown of the wonderful truffles included in your April gourmet chocolate box: Amaretto – Elegant dark on dark chocolate with the essence of almond is drizzled with white and milk chocolate. Black & White – Vanilla and white chocolate cream are wrapped in a dark chocolate shell and crowned with a hand-piped heart. Black Forest–This truffle, inspired by the classic Bavarian cake, has a semisweet center with a deep, sensual cherry flavor. Cappuccino–A must for coffee lovers, this truffle is an exceptional blend of chocolate, coffee, and cream. Champagne – A salute to the effervescent taste of champagne, this silky, infused milk chocolate ganache truffle is adorned with pink sugar sparkles to suggest bubbles. Cherry Cheesecake – This delectable milk chocolate truffle has a sweet, white chocolate center with just the right touch of cherry. Chocolate on Chocolate – A chocoholic’s dream, this truffle contains rich dark chocolate ganache surrounded by dark chocolate and drizzled with more. Chocolate Caramel – Milk chocolate captures the soul of caramel in this smooth, flavorful treat. Coconut – One bite transports you to the tropics. This sublime combination of white and dark chocolate is enhanced by the essence of coconut. Espresso – This distinctly dark truffle is pure coffee rapture. Hazelnut – A surprise inside; this bittersweet shell reveals a mélange of milk chocolate ganache and hazelnut's toasty, full flavor. French Vanilla – White chocolate ganache, in harmony with delectable bourbon vanilla, is coated with a palate-pleasing milk shell. Grand Marnier – Dark chocolate ganache (heavy cream and chocolate combo) with a subtle hint of orange enveloped in an equally luxuriant dark chocolate shell. Irish Cream – The comforting warm flavor of Irish Cream combined with milk chocolate makes for a scrumptious truffle. Luscious Lemon – Light, tangy, tart. No one word other than “magnificent” describes this wonderful combination of lemon-infused white chocolate and bittersweet dark chocolate. Milk Chocolate – A customer favorite, this velvety milk chocolate truffle is valued for its simplicity and elegance. Mint – With a distinct fragrance, a smooth white chocolate and peppermint center and an intense semi-sweet chocolate coating, this truffle is sure to please. Peanut Butter – The smoothest peanut butter imaginable is blended with the creamiest milk chocolate available, resulting in a truffle that has no equal. Raspberry – Fruit and chocolate are in perfect balance in this delectable dark chocolate truffle. Some Like it Hot – Chili and spices infuse the cream and chocolate ganache center, wrapped in a sumptuous milk chocolate shell. Strawberry – With a dark chocolate shell and delectable strawberry and white chocolate center, this truffle is as pleasing to the eye as it is to the taste buds. Tiramisu – This dark chocolate truffle's white chocolate center has complex layers of flavor emulating the layers of the classic Italian dessert. White Chocolate – This uncomplicated truffle is made from a white chocolate ganache with an understated hint of vanilla and sheathed in pure white chocolate. White Decadence – Dark chocolate ganache, with its characteristic hint of bitterness, is mellowed by a silky white chocolate shell. An inspired contrast! Did you ever wonder how someone could come up with such a scrumptious concoction as the truffle? Given that the term "truffles" has referred to underground fungi far longer than chocolate confections, one wonders how the bridge from tasty mushroom to intoxicating divinity occurred. The truffle is named for its visual similarity to the French mushroom-like fungus of the same name. Mold (mushroom) truffles have been mentioned as far back as the Bible and have been a delicacy greatly sought after throughout the ages in many cultures. (In recent years, during the Kuwait War, some Kuwaitis were more upset over the loss of truffles than they were the ransacking of their country!) With the discovery of the New World, many new foods and cooking techniques were introduced. One of these was none other than chocolate, and it quickly become the rage of its day. During this same time, ground truffles were still only available to those lucky enough to find them or with the wealth to buy them. It was a very ingenious person who discovered that a truffle could be preserved for some time in brandy or port, the liquors absorbing some of the truffle’s aromas, essences, and esters. Chocolate shells were then created, into which small quantities of this liquid were poured, and then sealed with a bit of chocolate. Suddenly the taste and aromas of both truffles and chocolate could be enjoyed together, and a new luxury for a new world was born! Like the original truffle, chocolate truffles have become synonymous with luxury and a sumptuous taste experience. They are made in a wide variety of flavors. In most chocolate houses, the chocolatier’s finest ingredients are reserved for the truffle.